Fine van Brooklin - Holiday! Posted on 19.3.2007 at 2.19. Well, well, well… I didn’t get as many decent photos in my “session” last week as I had hoped, so I won’t be able to show that many new pieces this time. Although this week the light has been great I simply haven’t had a chance to do any more photography either. That’s a bummer because I’ve finished quite a few colourful little numbers lately. Anyway, all that will have to wait for at least another week because tomorrow this girl is off to BARCELONA!!!!! Just before I go, here’s a little spring sweetness and craziness: Pearly and Brooksie. 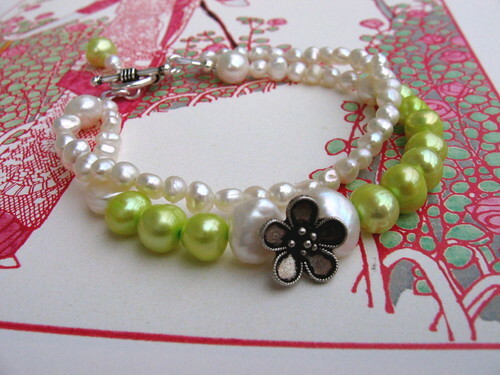 Pearly bracelet. 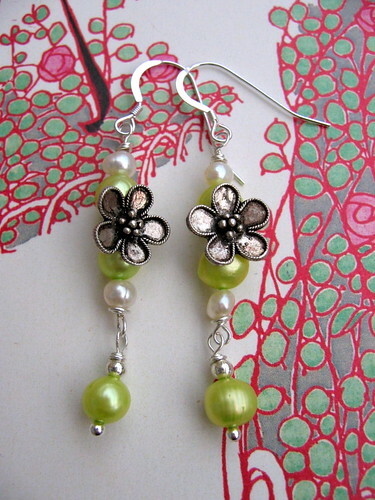 I had one string of green and white freshwater pearls that I really wanted to use. They all looked completelty different and charmingly bumpy, just the way I like them. Pearly earrings. The little silver flowers came from the Buenos Aires “booty of fabulousness” as Tiffini commented a while back :)! I made this set in the peace and quiet of my hometown two weeks ago. Brooksie bracelet. This bracelet looks and feels really nice on the wrist, even if I say it myself. I thought I’d make several of these later, in different colours and with different focal points. 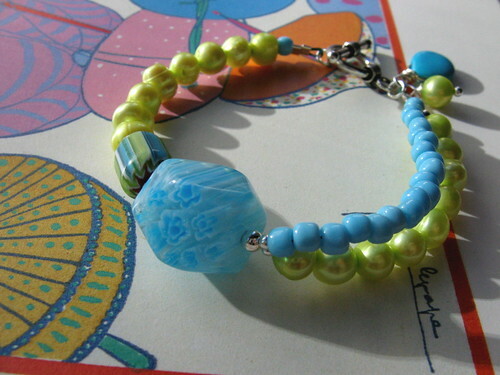 For the moment I’m out of green pearls and only had one of these funny millefiori glass beads. All the background images in this and my previous post are from the same book, “Parisian Fashion” that I’ve mentioned earlier here. So, see you after my holiday! I hope the trip will bring much needed relaxation and inspiration. Have a great week, each and every one! Fabulous pieces once again!! Marvellous green-and-white set, love it! I love love loooooooove the Pearly set! It’s so cute and fresh! Kauniit kuvat ja ihanat korut. Lime ja turkoosi on niin ihana pari. Ihana toi helmien himmeä kiilto. Fabulous! Loved those freshwaterpearls! Also loved the way you use them! 🙂 Have a fun trip! Vihreät helmet ovat etenkin tuossa eka kuvassa kuin pieniä herneitä..
Kiva idea tuossa alimmassa korussa. Miksi tosiaan pitäisi olla symmetristä? OH!!! How did I miss this post with all of it’s gorgeous eye candy???? I’m glad your trip went well!! Thanks for checking in and letting me know!! I love the way the green of your pieces pop against the pink background, so pretty.